How to start affiliate marketing? What is affiliate marketing and how does it work? Want to know real life Affiliate marketing example? Well, as a blogger, you must have seen a good variety of affiliate programs so far. At first maybe you don’t have an idea behind it. Affiliate marketing is a technique which will help you earn better income without using Adsense. Adsense is one of the best source of income which we will discuss in the future articles. Today in this post we will share the basics of affiliate marketing and all the details you need to know in order to understand how affiliate marketing works. Affiliate marketing is a very older term of marketing. It is also very simple to understand. If you refer someone a product and when that person buys the product by your recommendation then you will receive a commission. From older days till now, this method is working fine in the real world. In blogging world , you need to deliver Digital or Physical product to the customer through the online store or website or blog and that’s what makes affiliate marketing interesting on how to deliver best tracking and affiliate strategy. 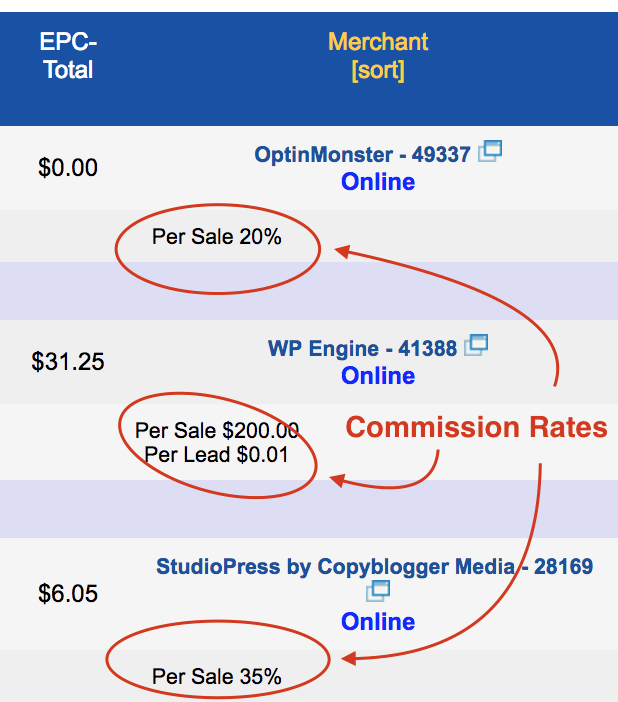 Commission could be from $1 to $5,000+ which depends on the product you are selling. This going to be long reading but trust me it's worth reading. Affiliate marketing is the best way to promote a product by online medium like blogging, domain, hosting, web application and much more. The company will pay money to the person who actually gives sell to them. There are more chances that advertisement and email strategy might get ignored by people but you need to spend money for it whether it gives you sells or not. Starting an affiliate program is a good way to start your affiliate program. It will give actual sell to company and company will pay to the person who has given them sell. Internet marketers and blogger will write articles and make videos regarding the product. If a reader buys that product after reading the article or watching a video then the company will give them a commission. Every Affiliate program has Terms of service. For example, most of the companies offer 45-days cookie period for their affiliate link. Which means that if a visitor goes to their website with a special affiliate link, which they have provided to you so that they can find that which person have recommended their product to this user. That link contains cookie which has validity of 45 days. So, the user which will go through this link to site’s landing or product page and buys something within next 45 days, you will be eligible to get the commission. Take a look at below Bluehost affiliate link. As you see here http://www.bluehost.com/track/crunfy/ is our affiliate link. If you click here and purchase any of Bluehost’s service then I’ll get some commission. Different affiliate programs offer different methods of payment. 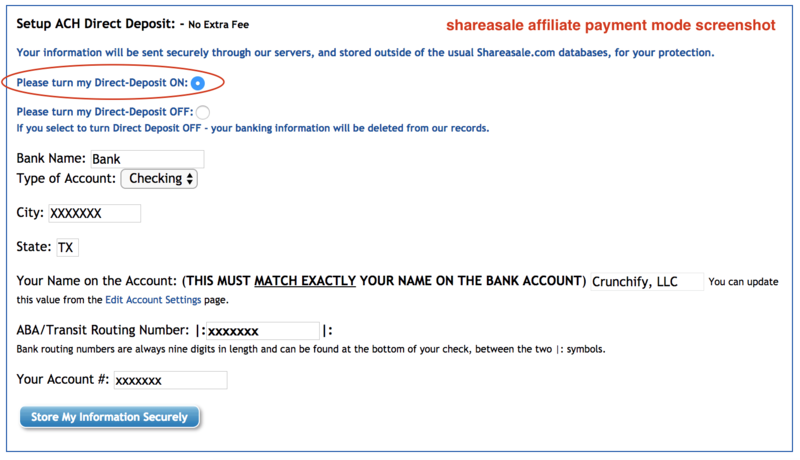 Take a look at this shareasale affiliate payment mode screenshot. I would suggest to use direct checking account transfer is the best and safe way to provide banking information. Have you ever heard of Shareasale, CJ, Amazon affiliate program, eBay Partner Network and much more. These work as central databases for affiliate programs in different niches. Most of the hosting companies like Bluehost, Hostgator and InMotion Hosting have their own Affiliate program as they have their own wide user base and it doesn’t make sense to spend money on third party affiliate programs. There are quite a few software companies out there which provides standalone software for affiliate program. Here are few of them: leaddyno, tapfiliate, postaffiliatepro. In this link http://www.bluehost.com/track/crunfy/, crunfy is my ID. We are hosted at Squidix hosting without any issue since last 4 years. So far we haven’t faced any issue. Here id=115 which is my Affiliate ID. ID might be numeric or alphanumeric. Shoutmeloud site also has very nice article on Affiliate marketing as we got some tips from them too. Not all but some of the companies offer special service like offering affiliate optimization tips to new users. I would suggest to use this service as mostly it’s free and it won’t harm you to get affiliate lesson from expert team. This is totally depends on advertiser. Like, StudioPress, Bluehost, Hostgator, OptinMonster, etc. They have full rights to setup their own commission rates. A product sales or demo page used for the purpose of increasing sales which includes features and plans of the product. Most of the programs that you will be promoting have many landing pages. Most of the affiliate tracking links are ugly and long. Using a link cloaking technique like URL shorteners, Thirsty Affiliates, etc., you can turn ugly links into links that can be read and understood by your readers. If you have your own sub companies and you suggest them to promote your link then if they sell product for your then you have give them some credit from your cut. It’s called 2-tier affiliate marketing. Many programs like siteground, flywheel, etc. allows affiliates to create custom coupons which are also used to track sales. Custom discount coupons help you to increase affiliate sales as well. Whenever you see coupons or discount links, these are affiliate links, and when you go through it and make a purchase from that, webmasters make money. I hope this beginner’s guide to affiliate marketing will help you get started with affiliate marketing. If you have any additional questions regarding affiliate marketing, feel free to ask me in the comments section below. Hi , Thanks for your post. I found it really useful. I’ve just posted on a similar topic on my blog. Thanks for sharing such an important article on affiliate marketing, I am a newbie to affiliate marketing and wanted to learn about it , ur blog gave me all the info from scratch to end every info. with examples. I want to do affiliate marketing I m very much interested but I do not have any blog for this I want to start my own blog and earn money through affiliate marketing. This article will surely help me in future. Good to hear that Charmi. Share your experience once you have good experties on Affiliate marketing. Making money is the most favourite process for every person in the world haha, especially in SEO activities. My recommendation is to use best hosting if you really want your site/blog to be successful and profitable. Agree Martha. Here are some more details on why we need better hosting for WordPress site.